Imran Khan and Ranbir Kapoor replaces Shahrukh Khan as the host of 54thth Feb 2009 Idea Filmfare award ceremony organised at Yash Raj Studios in Andheri on 28. 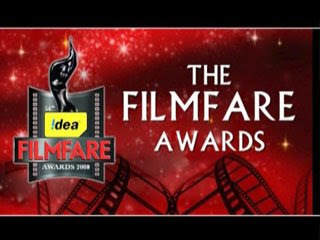 From the first award given in 1953 the filmfare awards become Oscars of Bollywood and deem to be very prestigious for one and all. Jodha Akbar sweeps the award later in the evening when it receives award for best film, best director and best actor. Well I can only say one thing as Slumdog Millionaire is related to India similarly 'Jodha Akbar' is related to Rajasthan so its a JAI HO for RAJASTHAN although due to controversy associated with its story the film has not been released in Rajasthan Theatres. But its the rich and colorful culture of Rajasthan which enhanced the beauty of this movie and several other movies. Best Dialogue: Mano Rishi for Oye Lucky! Lucky Oye! Special jury mention to Prateik Babbar and Purab Kohli for Jaane tu ... and Rock on! Abhishek Kapoor - Rock On!! Javed Akhtar - Socha hai- Rock On!! Farhan Akhtar - Socha hai- Rock On! !